In a cast iron skillet (if you don't have a cast iron or oven safe skillet, have a baking dish near by to transfer mixture to in order to bake it) heat oil and cook leaks and peppers until tender. salt and pepper to taste but add a bit extra as the eggs will dilute the flavor. Add in eggs, milk and mix well. Top with cheese and transfer to the oven. 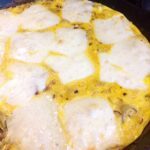 Bake until frittata is firm to the touch and cheese is melted.